Get ready to sync your clothes with your Gear VR. 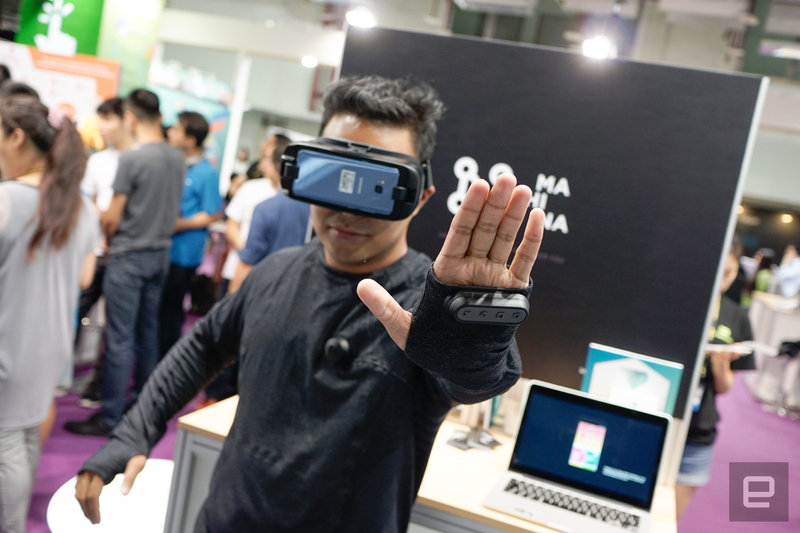 Virtual reality is inescapable here at Computex: You're either stumbling into another Vive demo area or bumping into the occasional VR backpack. What's often missing is a sense of true immersion, and a startup called Machina is trying to fix that. Co-founder Antonio Perdigon was nice enough to let me don one of his unreleased "OBE" connected shirts here at the show, and after a little playtime, I think the team might be on to something. That's not actually a huge surprise: Machina is no stranger to the connected-clothing scene. Perdigon and co-founder Linda Franco have been at it since 2011, and they're perhaps best known for their MIDI jacket, a wearable electronic instrument that doubles as a stylish way to stay dry. While the company's early work tried to enshrine creativity in cloth and wire, its subsequent OBE (Out of Body Experience) line was meant to bring a person more fully into the depths of VR. Sensors attached to an OBE shirt or jacket could track a wearer's motion the way an Oculus controller can, while haptic modules would provide physical feedback at the right times. Did your avatar just take a 0.5-caliber slug to the chest? Expect a lot of throbbing. Curiously, the company's goal (for now) is to connect all those wearable sensors to mobile rigs like the Gear VR, which offer experiences that can feel rudimentary compared with more-powerful desktop fare. This added dose of immersion could help mobile VR transcend the limitations of the smartphone/headset combo, but only time will tell. Despite having worked on the OBE line for the better part of two years, Perdigon admits the pieces still need work. The company originally aimed for a fall 2016 launch, but soon found that the sensors would be too expensive to produce. That led to even more redesigning and retooling, and eventual success -- the sensors could finally be made on the cheap. Then came the process of finding the right garment suppliers, which the team eventually found here in Taiwan. Now, they're furiously trying to iron out all the bugs before launching these clothes into beta later this year. The idea of "beta" clothing may sound odd -- and it sort of is -- but it's definitely the right label. I took a prototype version of one module, the combination motion tracker/game controller, and it still seems to need work. After strapping on a Gear VR, Perdigon dropped me into a virtual pasture filled with balloons I could shoot by pointing my hand and clicking a button. Getting my bearings and lining up my sights took time because the Bluetooth connection was flaky, prompting my virtual arm to do lazy loops around my head. Once fixed, though, I killed those balloons without mercy and jerked my arm to reload just because it felt cool. It's a neat demo, but the underlying system could use a lot more polish before the official launch. Even so, Machina's work may still find success outside the realm of VR immersion for a few reasons. For one, the company's gear just looks good. Constructed from a blend of cotton and polyester, the OBE shirt featured a subtle heather-gray finish and smartly designed venting under the arms. The only sign that this isn't just a normal, presumably pricey shirt are the four sensor ports: You can plug modules into either wrist, your chest (à la Iron Man) or the nape of your neck. The fabric was a little much for the almost-oppressive heat here in Taipei, but hey, people still seem into premium "athleisure" gear. Forget the connected angle for a second: This is a shirt I'd probably wear anyway, even if isn't terribly flattering for my midsection. The haptic module, meanwhile, could buzz up against your skin whenever a notification pops up on your phone. If you had several attached to your smart shirt, you could feasibly have different parts of your body vibrate based on who's trying to contact you. Perdigon says Machina is working on an IFTTT-style app to connect to those sensors, so connecting them to your favorite services should be dead-simple. "If you got a 'like' on Facebook, for example," he said, "the sensor over your heart could vibrate." Who says technology can't make you feel loved? Fashion and technology don't always collide elegantly, but Machina's work proves it can be done. Whether it actually forces the rest of the industry to think more broadly about what mobile virtual reality can be is unknowable. In the meantime, though, there's just something viscerally exciting about seeing a very geeky, very personal kind of product get so many things right. Click here to catch up on the latest news from Computex 2017!